Theanine Serene with Relora contains the amino acid L-theanine to support relaxation and focused attention, and the calming neurotransmitter GABA. Taurine can support the movement of potassium out of neurons which may help prevent over-excitation of neurons. It also features magnesium to support muscle and nerve relaxation, calming holy basil leaf extract and Relora to gently soothe away the tension in your body. Relora contains magnolia and philodendron extracts that may help relieve temporary anxiety. Try Theanine Serene with Relora to start relaxing today. This is a unique calming formula with specialized ingredients that promote alert relaxation without drowsiness. L-Theanine is an amino acid found in aged black and green tea which, combined with other calming ingredients, helps to relax your mind and body while allowing you to maintain an alert mental state. This product is suitable for vegetarians and contains no yeast, dairy, egg, gluten, corn, soy, wheat, sugar, starch, salt, preservatives, artificial color, flavor or fragrance. 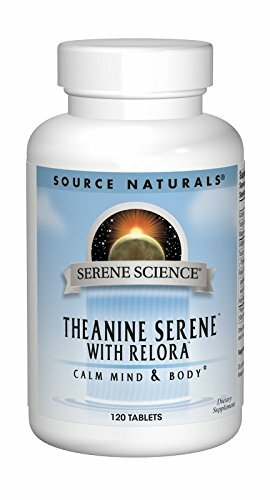 Theanine Serene with Relora features powerful combinations of herbal extracts known to alleviate mild anxiety and stress naturally. This supplement can be effective for those searching to relieve emotional imbalance, daily stress and mental fatigue by facilitating effective signaling of neurotransmitters, improving the bodys reaction to stressors.